The Henry Cow Legend (often referred to as Legend or Leg End [nb 1]) is the debut album of British avant-rock group Henry Cow. It was recorded at Virgin Records' Manor studios over three weeks in May and June 1973, mixed in July 1973, and released in August 1973. With the exception of "Nine Funerals of the Citizen King", which the whole group sings, and background voices on "Nirvana for Mice" ("Sweet mystery of life I will remember"), "Teenbeat" and "The Tenth Chaffinch", this is an instrumental album. The jazzy Canterbury sound on some of the pieces shows Henry Cow's beginnings, although they quickly moved on to establish their own unique sound. With the Yellow Half-Moon and Blue Star is a Fred Frith composition that was commissioned by the Cambridge Contemporary Dance Group under Liebe Klug, and was named after a painting by Paul Klee ("Avec la demi-lune jaune et l'étoile bleue"). Only an extract appears on this album, but the full 16-minute version of the suite is included in The 40th Anniversary Henry Cow Box Set (2009). Parts of "Teenbeat" began in With the Yellow Half-Moon and Blue Star and parts of it were later incorporated into "Ruins" on Unrest (1974). "Nirvana for Mice" was originally called "Nirvana for Moles" during Legend rehearsals, and later became "Nirvana for Rabbits" when performed live in Hamburg in March 1976. ... there's a whole section in the middle where it goes into 21/8 and stays there. [Henry Cow] keep messing around with the bottom measure. They keep flipping from 5/8 and 5/4. But, it doesn't sound like the fusion stuff that was starting to happen ... This music sounded terribly organic. And when you stripped it back that was when you'd realize how complicated it was. The album cover art work was by artist Ray Smith and was the first of three of his "paint socks" to feature on Henry Cow's albums. [nb 2] Smith had appeared with the band at several of their early 1970s concerts, performing a variety of activities, including ironing, reading text and mining with glove puppets. 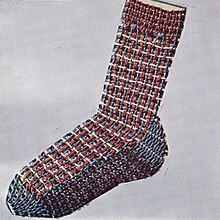 He suggested a woven sock on Legend's front cover, and insisted that the band's name should not appear there. Chris Cutler said in a 2011 interview that Smith continued the theme on Henry Cow's next two albums, with the sock changing "to suit the temper of the music". In his book Prog Rock FAQ, Will Romano wrote that Legend "might [have] the most unusual and slightly amusing cover featuring a sock." Smith explained that the sock has no connection to the music, "It's an independent object". It was created by "weaving dry stands of acrylic paint on the canvas" which Smith said "suggest[s] something electrical". He described the picture of the sock on the album cover as "clear, fresh and optimistic". In 1991 East Side Digital Records issued a remixed version (by Tim Hodgkinson, May/August 1990) of Legend on CD. Fred Frith collaborated with Hodgkinson on the remixes of "Nirvana for Mice" and "Teenbeat." The CD included a bonus track, "Bellycan", which was an outtake from Henry Cow's Greasy Truckers Live at Dingwalls Dance Hall recording session in November 1973. On the remix of "Amygdala", Lindsay Cooper, who was not yet a member of the group at the time of the LP recording, played bassoon (recorded August 1990) and replaced Geoff Leigh's saxophone, which Hodgkinson felt was "too jazzy". In addition to this, there were other radical mix changes (for instance, the closing vocals of "Nirvana for Mice" were mixed prominently in the original vinyl mix but are barely audible on the CD). In a review at AllMusic, Mike DeGagne called Leg End a "busy musical trip" that produces some complicated yet interesting progressive rock. He said that while the "eclectic, avant garde-styled jazz movements" appear directionless, closer listening reveals some "first-rate instrumental fusion", although, DeGagne added, "a little too abstract at times". Music journalist Robert Christgau said the music on The Henry Cow Legend is composed to stimulate improvisation, and is "more flexible" than King Crimson's, and "more stringently conceived" than Soft Machine's. He added that as often happens with this approach, "not everything works", but "you can listen to what few lyrics there are without getting sick". Jeremy Baines – pixiphone on "Yellow Half-Moon"
Sarah Greaves, Maggie Thomas and Cathy Williams – chorus on "Teenbeat"
^ The original LP release was entitled The Henry Cow Legend, with the name appearing only on the spine of the record sleeve. The 1991 CD edition was retitled Legend, and the 1998 original mix remastered CD edition was retitled Leg End. ^ Legend's sock also features on the 2006 Henry Cow Box cover. ^ "Nirvana for Mice (Reprise)" is included in "Extract from 'With the Yellow Half-Moon and Blue Star'" on the LP and 1998 CD releases and not listed separately. ^ 1991 CD bonus track. ^ When Henry Cow arrived at The Manor for their first recording session, the recording engineer, Tom Newman was "under the table", and Mike Oldfield undertook the recording duties for the first session. ^ "Henry Cow – The Henry Cow Legend". Discogs. Retrieved 1 June 2010. ^ Kelman, John (12 January 2009). "Henry Cow: The 40th Anniversary Henry Cow Box Set". All About Jazz. Archived from the original on 30 July 2017. Retrieved 6 January 2018. ^ Cutler 2009, p. 7. ^ Cutler 2009, p. 6. ^ a b c Romano 2014, "Chapter 17 | Shock to the System | Henry Cow and Rock in Opposition". ^ "Henry Cow Chronology". Calyx: The Canterbury Music Website. Retrieved 28 February 2018. ^ "Chris Cutler interview about Henry Cow, Art Bears, Cassiber..." It's Psychedelic Baby Magazine. 22 December 2011. Retrieved 28 February 2018. ^ a b Romano 2014, "Chapter 8 | Escape Artists – Designing and Creating Prog Rock's Wondrous Visuals | Henry Cow: Legend (1973)". ^ Cutler 2009, p. 4. ^ Feigenbaum, Steve. "Henry Cow Discussion". Progressive Ears. Retrieved 17 August 2015. ^ a b c DeGagne, Mike. "Leg End". AllMusic. Retrieved 20 December 2017. ^ a b c Christgau, Robert (1981). "Consumer Guide '70s: H". Christgau's Record Guide: Rock Albums of the Seventies. Ticknor & Fields. ISBN 089919026X. Retrieved 26 February 2019 – via robertchristgau.com. ^ Cutler 2009, p. 3. Cutler, Chris, ed. (2009). "The Road: Volumes 1–5". The 40th Anniversary Henry Cow Box Set (box set booklet). Henry Cow. London: Recommended Records. Romano, Will (2014). Prog Rock FAQ: All That's Left To Know About Rock's Most Progressive Music (e-book ed.). Milwaukee, Wisconsin: Backbeat Books. ISBN 978-1-61713-587-3. "Nine Funerals of the Citizen King" lyrics. Calyx: The Canterbury Website. "Living in the Heart of the Beast"
This page was last edited on 9 March 2019, at 20:02 (UTC).